The world’s biggest atom smasher has restarted after its two-year shutdown.Scientists at the Large Hadron Collider (LHC) hope the upgrade will allow them to smash protons together with nearly double the energy previously reached. Analysis of the “rubble” could lead to the discovery of new sub-atomic particles, revolutionising our understanding of physics. Two beams of protons will be sent in opposite directions around LHC’s 17-mile tunnel circuit on the Franco-Swiss border. Powerful magnets bend the beams so they collide at points around the track where four laboratories monitor the smash-ups. The sensors examine the collisions for new particles and the forces that hold them together. 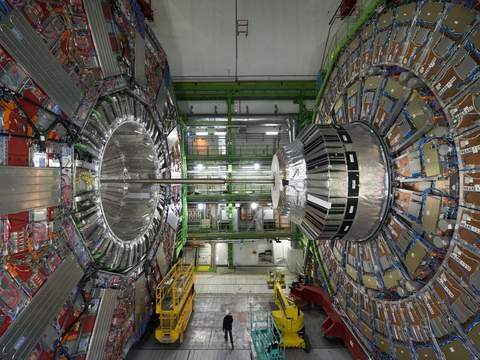 In 2012, the LHC discovered the Higgs Boson, an elementary particle that gives other particles mass. During the next phase, experts hope to investigate “dark matter” – the invisible material said to make up much of the universe. For the past two years, the giant machine has had its maximum collision capacity boosted from eight teraelectronvolts (TeV) to 14 TeV – seven TeV for each beam. The initial tests will see engineers inject two beams into the tunnel at a lower energy of 450 gigaelectronvolts, but with no collisions. If all goes well, “particle collisions at an energy of 13 TeV could start as early as June,” the European Organisation for Nuclear Research (CERN) said.